Before starting the real design work, we wanted to study the bothersome standing headroom question. We have to solve that problem before working on the data and ratio comparisons because it does affect the size of the boat. Are we going to look at a 24 or at a 28 footer? The problem is bothersome because it is not, IMHO, an important requirement. It is however close to the top of the list of the questions asked on our message board, especially by people with less experience. 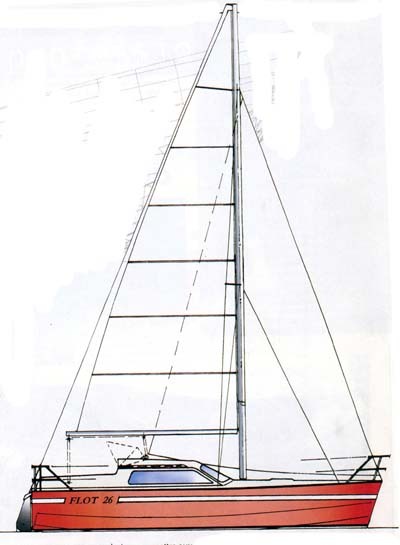 Like many experienced sailors, I agree with Herreshoff: "If you want standing headroom, go in the cockpit". Since we want to sell plans, we will make a concession and try to provide headroom but not at any price. We will not design an ugly boat with an excessively high cabin roof. It is also a matter of strength: those high sided roofs are weaker and not acceptable in an offshore boat. And offshore is an important element in the boat's definition. Let's quickly scale the Serpentaire 22 and see if one can stand in the cabin. 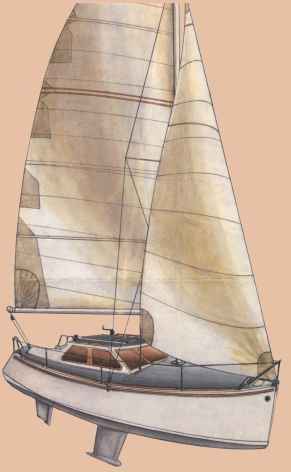 In the sketch above, the boat is 26' long and the man 6' high, standing almost in the bilges, with no floor, no allowance for roof beams. It looks like we are going to need to go to 27 if not 28'. Let's see what other designers do. I known we could have started that way but the sketch shows how disproportionate a smaller boat with headroom would be. The smallest Serpentaire with headroom is 28' long. It is an integral centerboarder. The Flot 8 m from Sylvestre Langevin looks great. It has 6' headroom. Built in Al, integral cenetrboard. The RM800 has also 5' 10" under the pilothouse. It is a twin keel boat. The Multichine 28 has close to 6' headroom at 28' long. CB in stub keel, much in the style of our boats. You notice that we prefer to compare to boats of the same style, same material or close and available as plans for amateurs but a comparison with fiberglass production boats would not have made a difference. We checked the Dudley Dix designs and can't find anything under 30' with standing headroom. We looked for US designs but couldn't find anything recent. Most of the US plans for plywood are very old and we couldn't find any modern plans for amateurs in the category that we defined. Most of the plans above are French. Roberto Barros is Brazilian but clearly influenced by French design. In our office, we call that shape a 5 panel hull. That section has many advantages. We may change it but probably not. More about it later. This quick overview of other design confirms our previous finding: the boat will be between 27 and 28' IF we want headroom over a sole. OK, ready to start comparing data and ratios. We'll do that in the next step.